10:55pm – The housemates are having a good time in the jacuzzi. 9:30pm – Tobi is doing laundry. 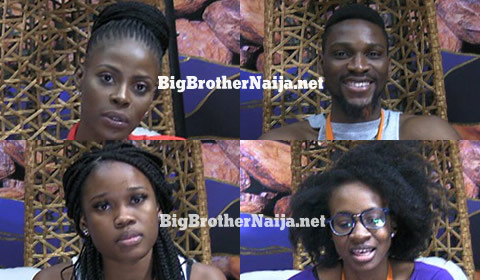 9:03pm – Tobi and Miracle are playing the Dice Game. 8:40pm – Alex’s diary session. 8:30pm – Cee-C’s diary session. 8:21pm – Tobi’s diary session. 8:05pm – Lolu’s diary session. 7:55pm – Nina’s diary session. 7:46pm – Khloe’s diary session. 7:33pm – Miracle’s diary session. 7:28pm – Anto’s diary session. 7:06pm – Today’s diary sessions kick off with Rico Swavey..
6:45pm – Big Brother informs the housemates that the front doors of the house may now be opened. 6:42pm – Big Brother orders the housemates to close the front doors of the house and remain in the garden until further notice. 6:35pm – Khloe is in the garden applying makeup. 2:09pm – Big Brother summons Miracle to the diary room. 2:05pm – Big Brother orders the housemates to close the front doors of the house and remain in the garden until further notice. 1:45pm – All the housemates are peacefully sleeping. 12:50pm – The housemates are gathered in the garden having a conversation. 11:38am – Lolu is flirting with Anto who’s in the kitchen cooking. 11:35am – Tobi and Miracle are seated in the garden having a one on one conversation. 10:30am – Miracle is sleeping on the garden couch. 9:38am – Lolu and Alex are in the garden having a conversation. 9:08am – Alex is doing laundry. 8:55am – The housemates are all in the arena after taking part in their morning workout session. 8:46am – Housemates’ morning work out session has come to an end and they’ve now exited arena. 7:55am – Housemates are in the arena for their routine morning workout session. 7:26am – The housemates have now began waking up one by one. Good morning to you all and welcome to day 65 of Big Brother Naija 2018, follow today’s Live Feed Blog for all the latest updates. You can as well check out yesterday’s highlights Here.